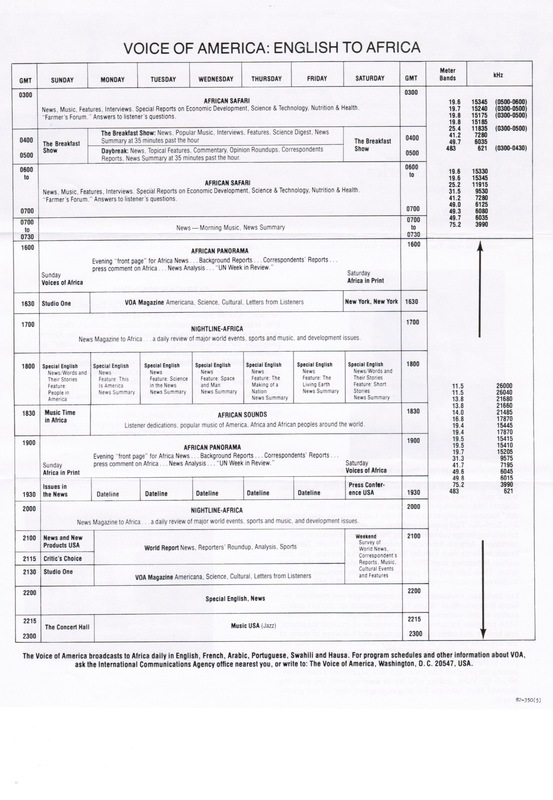 The Voice of America (VOA) May-October 1982 English-to-Africa Service Program Schedule flyer included descriptions of “African Sounds” English-to-Africa program, hosted by VOA French-to-Africa Cameroonian-born broadcaster Georges Collinet, and “Music Time in Africa” program hosted by Leo Sarkisian and Rita Rochelle. 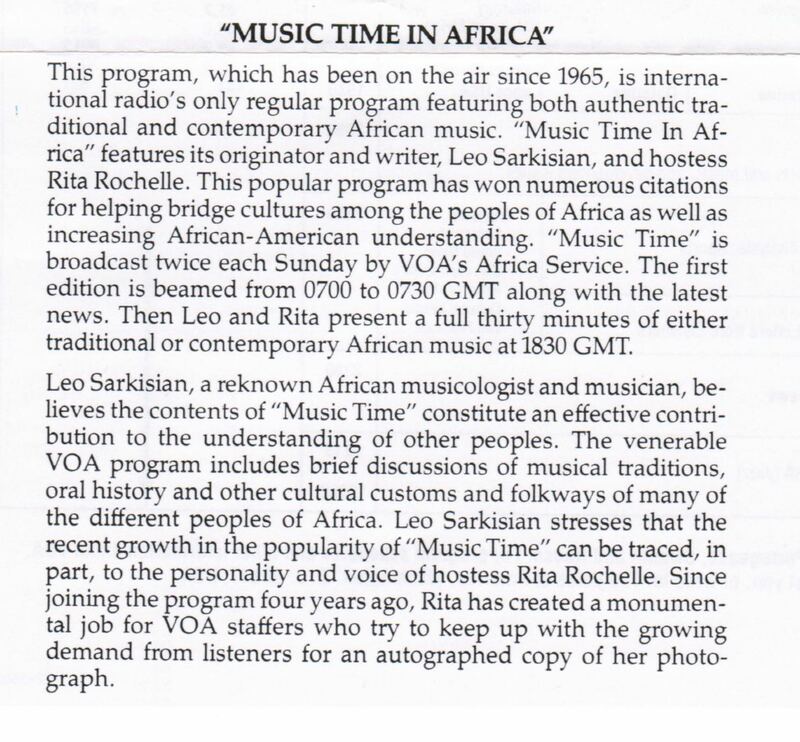 Voice of America (VOA) “Music Time in Africa” program hosts Leo Sarkisian and Rita Rochelle in May-October 1982 VOA English to Africa Program Schedule Flyer. This program, which has been on the air since 1965, is international radio’s only regular program featuring both authentic traditional and contemporary African music. 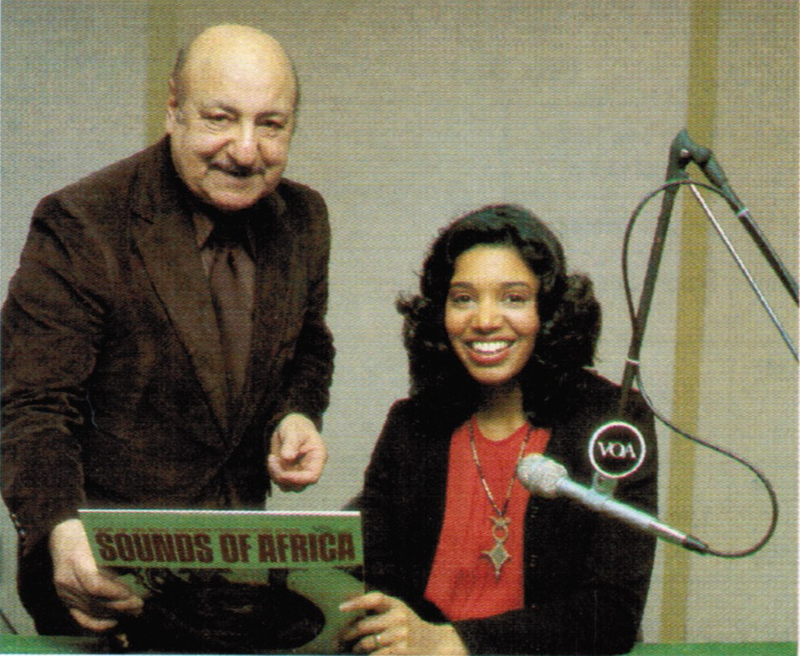 “Music Time In Africa” features its originator and writer, Leo Sarkisian, and hostess Rita Rochelle. This popular program has won numerous citations for helping bridge cultures among the peoples of Africa as well as increasing African-American understanding. “Music Time” is broadcast twice each Sunday by VOA’s Africa Service. The first edition is beamed from 0700 to 0730 GMT along with the latest news. Then Leo and Rita present a full thirty minutes of either traditional or contemporary African music at 1830 GMT. Leo Sarkisian, a reknown African musicologist and musician, believes the contents of “Music Time” constitute an effective contribution to the understanding of other peoples. The venerable VOA program includes brief discussions of musical traditions, oral history and other cultural customs and folkways of many of the different peoples of Africa. Leo Sarkisian stresses that the recent growth in the popularity of “Music Time” can be traced, in part, to the personality and voice of hostess Rita Rochelle. Since joining the program four years ago, Rita has created a monumental job for VOA staffers who try to keep up with the growing demand from listeners for an autographed copy of her photograph.